Jawza’ was and is a highly celebrated star grouping in the night sky. Like Thuraya, Jawza’ is a fantastically old star name that has been anthropomorphized over time. By the time of Ibn Qutayba (died 889 CE), Jawza’ was a fully articulated human figure, the only one in the Arabian sky. (Thuraya only has a head and two magnificent arms.) However, it is most likely that the earliest iteration of this asterism consisted of just the three central stars that form a straight line. Indeed, the name Jawza’ comes from the Arabic root that means something in the center. These three stars are known to us today as the Belt of Orion. An ancient Arab legend speaks of a woman named Jawza’. A very long time ago, she was promised to a man named Suhayl. This man lived across the river with his two sisters, known together as the Shi’rayan (the Two Shi’ra‘s). When her wedding day came, Jawza’ and Suhayl were at last united, but her wedding night brought disaster because Jawza’ was dead by morning. Suhayl feared for his life as the family of Jawza’ sought blood vengeance, so he fled far to the south, away from his two sisters. One of his sisters crossed the river to be closer to him as he fled, and so she was thereafter called the Shi’ra Who Crossed Over (ash-shi’ra al-‘abur). Suhayl’s other sister stayed at home on the other side of the river, where she cried and cried until tears and puss filled her eyes. She was thereafter called the Little Bleary-Eyed Shi’ra (ash-shi’ra al-ghumaysa’). Jawza’ as she appears setting in the west about 45 minutes before sunrise in early December. Sky simulations made with Stellarium. The core of Jawza’ is a line of three very bright stars that is known in modern times as the Belt of Orion. The remainder of the figure of Jawza’ incorporates the remainder of the Greek figure of Orion, as well as arcs of stars that represent her Hair and her Bow, plus Two Footstools. She also has a grouping of stars representing her Maidenhead that lies far away in the modern-day constellation of Canis Major. The central three stars of Jawza’ take 3-4 nights to rise or set, but the extended figure of Jawza’, including her Bow, Footstools and Maidenhead, take several weeks to rise or set. Today we can expect to observe Jawza’ setting in the west (about 45-60 minutes before sunrise) from early December through early January, and rising likewise from early July through the middle of August, as seen from the latitude of Tucson. 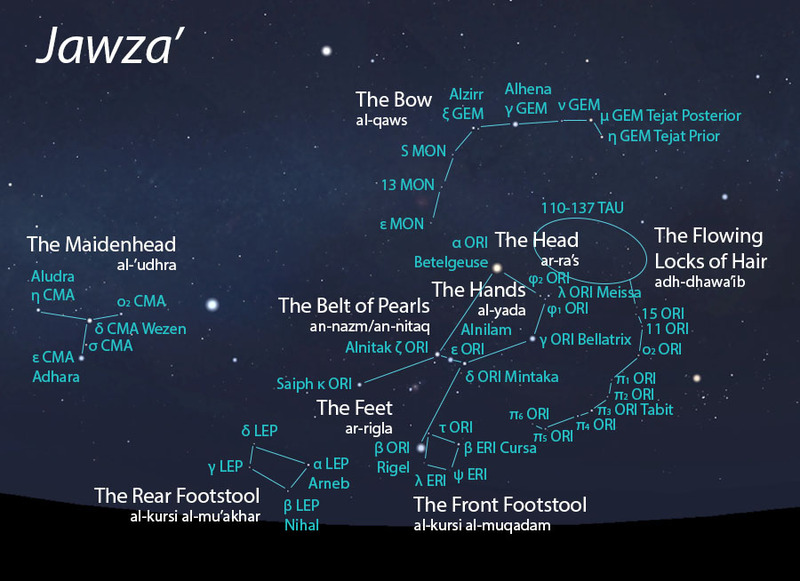 In the rain star calendars of Qushayr and Qays, the pre-dawn setting of Jawza’ (as the central three stars that were later identified as her Belt of Pearls) marked the start of the cold winter season called ash-shita’. 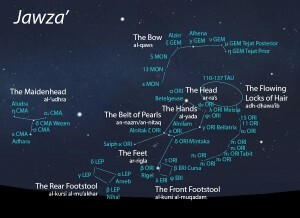 In early listings of the lunar stations, the Head of Jawza’ as the Hair Whorl (al-haq’a) is the seventh station of the year, and the hilt of her Bow as the Neck Mark (al-han’a) is the eighth station. This was later changed to the fifth and sixth lunar stations, respectively, after the stations were adjusted to begin with the vernal equinox.